We love to hear from our loyal listeners and recently several of you shared the same thoughts for us. You shared that you and your family love listening to Discovery Mountain so much that you wished there was something new every week. We listened and we came up with an answer: mini adventures! Discovery Mountain will continue to create the same high quality episodes that you’ve come to expect! With four seasons per year you and your family will have 24 all new full-length episodes each year, featuring all of your favorite characters. In addition to these 24 episodes we’re adding new mini adventures! Discovery Mountain mini adventures are just what the name tells us—mini programs! These minis will be fun and engaging audio adventures in a variety of formats. Some weeks we’ll interview voice actors, and other weeks we’ll hear fun game show style contests that you can participate in too! Mini adventures will provide you and your family with the same level of character-building audio programming that you’ve come to expect from Discovery Mountain. Our first two mini adventures will air on March 14 and 21, 2018. 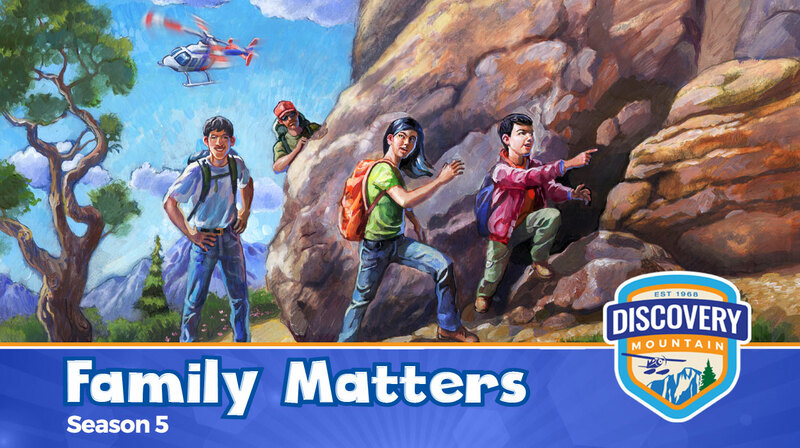 On March 28th Season 5 “Family Matters” launches with a brand-new 10 part audio adventure series. In Season 5 we meet Emma and Ethan Ward and we spend some time exercising our faith as we learn the story of Moses right along with them. Let us know how you’re enjoying our new mini adventures. Do you have an idea for a mini adventure that you’d like to hear? Send us a message, we’d love to hear from you!